Erika D. White definitely walks the talk. Her talk about fitness is grounded in 11 years as a certified fitness professional. When it comes to overall health and wellness, Erika is realistic when talking about her personal experiences with healthy eating and weight loss. 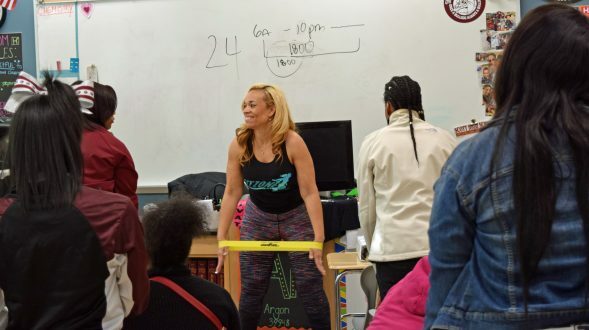 Erika D. White gives a health and wellness talk to students at Scott High School. Recently, health and wellness talks with students at Scott High School – which serves an urban Toledo neighborhood without a major grocery store and extensive bike lanes – included encouraging them to be aware of what is going on around them. Volunteer and advocate, she told them. And don’t just sit at the table but participate and be heard. “Each one of you has the power and ability to change things,” said Erika, who was elected Executive Committee Vice Chairman by the Healthy Lucas County coalition of community health improvement organizations. A representative for both NAACP 3204 and CWA Local 4319 on the Executive Committee, Erika plans to begin blogging for Healthy Lucas County. She also is an Advisory Board Member for the University of Toledo’s Catharine S. Eberly Center for Women, is involved in Toledo’s African American Male Wellness Walk Initiative and active in other organizations. Well known for her Fitzone By Erika enterprise, Erika has been the fitness and diet expert for 13abc since 2015. Erika does a segment on the noon news on Tuesdays. Additionally, Erika is pursuing a degree in health and wellness management for healthcare from the University of Wisconsin. Eat right, spreading calories throughout the day. Attain and maintain a healthy weight. Get checkups for blood pressure and other health indicators. Making health and wellness work for everyone is one of Erika’s priorities, and results certainly will differ. Don’t risk missing one of Erika’s blog posts for Healthy Lucas County. Subscribe to her posts and other coalition updates by clicking on the yellow “Sign Up For Our Latest News” box at the bottom right of your screen and following the instructions.